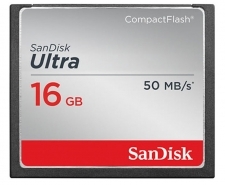 With its fast data rates and reliable performance, the SanDisk Ultra CompactFlash Memory Card helps you get the most out of your camera, camcorders and other devices that support CompactFlash memory cards. This CompactFlash card comes in capacities of up to 32GB, so you can keep shooting without worrying about running out of space. SanDisk Ultra® CompactFlash® memory cards deliver the ideal combination of reliability, value, and performance for casual photographers with entry to mid-range DSLRs. Capture the moment with ultra fast shot speeds and save time moving files to your computer with transfer speeds of up to 50MB/s** (8GB – 32GB). For dependability and solid performance, you can count on SanDisk Ultra CompactFlash memory cards to capture and store your favorite pictures and videos. That's why for memories that can’t be missed, photographers worldwide choose SanDisk. The SanDisk Ultra CompactFlash memory card has plenty of room to accommodate high-resolution image formats, such as RAW and JPEG. Available in capacities up to 32GB, it can store thousands of photos and your favorite video clips. Performance: 4GB: Up to 25MB/s** read; write speed lower. 8GB-32GB: Up to 50MB/s** read; write speed lower.